I can't believe the twins are already over three weeks old. 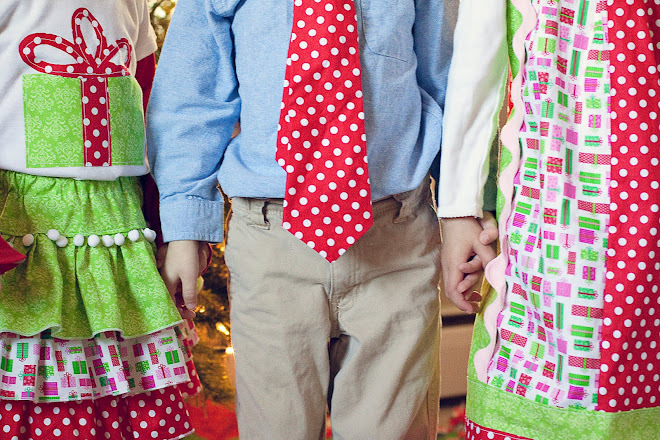 Sometimes it seems like we have known them forever and sometimes I wake up and have to remind myself, I'm a Mommy! I thought I would take a minute to tell everyone how the big Birthday went down. Nothing gross, I promise. On Monday the 12th I went to the doctor after having some symptoms of preeclampsia. They told me to call if I saw "floaters" and I did as was told and came in. My blood pressure was up and so was my proteins. My doctor was in surgery but his partner said, " I know you are being induced tomorrow but as a precaution why don't we admit you now". Ugh. Ryan and I were suppose to go out to dinner one last time! I wasn't ready to now go home but they wheeled me over to the hospital. I called Ryan and he came with my stuff. My doctor came in later and did an ultrasound to make sure they were both still head down, they were. He decided to "let us get some sleep" and not start the induction until 4 am. Wow, thanks. Neither one of us got any sleep between nurses constantly checking my blood pressure and having horribly uncomfortable beds. At 4 am they did indeed start the pitocin. No big deal at first. At 7:30 am my doctor came in and I was dialted to 4, he broke my water. Things got bad after that. I was getting some "real" contractions and I decide, "If I'm getting an epidural I may as well get it now and enjoy it". So around 9:30 am they came and did the epidural. That was okay. 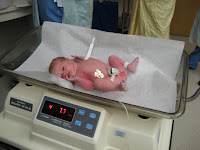 They had to poke me three times because of the twist in my spine caused by carrying so much baby. It was a weird feeling but worth it in the end! They checked me again after I got the epidural and I was at 6-7. Yay! Progress. I called people now and updated them, I felt good! At around 1 pm or so I was fully dilated and started pushing. During this time the babies heart rates started going down and the doctors got a little worried. 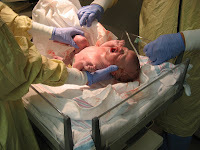 they started talking c-section if I couldn't get the babies out fast enough. After an hour of pushing in my room they thought I was ready. They wheeled me over to the operating room, as a precaution all twins are delivered there. 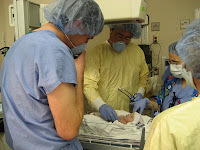 We were joined by over thirteen staff members, (NICU staff, nurses, anesthesia, 2 ob's) several students were looking through the windows and of course Ryan and I were there. Ryan really enjoyed wearing the scrubs I think! Once everyone was in place the pushing began again. They decided Baby A needed to get out pretty fast so they used a vacuum. Luckily Reagan still came out with his perfect little head in tact. A boy! Yay! We were very excited but I was a little out of it you might say. I kind of zoned out after Reagan was born and had to be reminded to push out Claire. Ryan didn't know if he should go see the baby or stay with his wife who seemed to have lost it! Luckily I came to and Claire was out 9 minutes later! A girl! Yay again! Both babies were a little small but were very healthy. The NICU staff was able to leave right away and we all got wheeled back to our family room. I recovered very well. I didn't even need all my pain meds. The abbies both stayed with us and went to the nursery so we could get some rest. 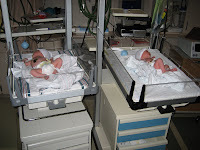 I was discharged two days later but the babies had come down with some jaundice and had lost some weight. They stayed in the NICU until Saturday, St. Patricks Day, when they came home. We are all happy to be home and enjoy all the nice people who have come to help. Here are some pictures from their birthday. 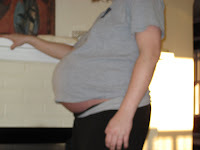 Okay so this isn't from the Birthday, but my last belly shot from a few days before delivery, this is why I was crabby. I'm already forgetting that though! Here he is, baby A. He wasn't happy to come out! Warming up in the room. Your babies are so beautiful... I can't wait to see them again soon!